in Latest News Articles on July 20, 2014 . David McKay has done a marvelous job in writing this book. 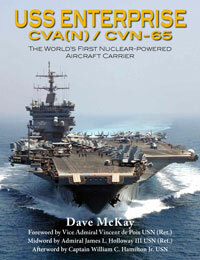 It is recommended to anybody who studies naval history. I have read books on the aforementioned subject for over 50 years, but I have never found such a well-done book as that done by Mr. McKay. To be honest, I can find nothing wrong with the book. Reviewed by Samuel Loring Morison, a former naval officer, writer and naval historian in his own right who served in the Vietnam War. This is one of the best books I have ever read. Dr Dave McKay's passion for the Enterprise really showed through and he also brought the book to life by having the crew and air group members tell their stories. Great chapter on the fire. The publisher is to be complemented too as this is one of the best laid out and produced books I have seen in a long time. Loved all the pictures and insignias put in the book. The only complaint I have is it is heavy to read in bed. The HMV brand is well known for paper models in perfect quality and design, accuracy and love of detail, beautiful technical and architectural models. Time and again we have wondered why no one has really brought out a truly comprehensive book on the aircraft carrier USS Enterprise long ago. The theme really gives much so much that one could write a whole book series about it. And now there really is a tome here with us on the table. All deployments are precisely documented including lots of pictorial material, and the appointed air wings are listed and pictured as well. Dr. McKay included not only a lot of photographs but also many insignia all his chapters. This comprehensive work is surely worth its price. Ray H Godfrey, as an Enterprise plank owner on board July 1961-July 1966, was an Engineering Department “Navy nuke” during his five years aboard Enterprise. Godfrey served the USS Enterprise (CVAN/CVN-65) Association from 1986 to 2012. See New Zealand's TV3 news interview of Dr Dave McKay and his experiences on multiple visits to the USS Enterprise CVN65 in the writing of his tribute to this great ship and her crews. See extracts from this new book on this fantastic ship from launch to inactivation. With a Dunedin (NZ) author Dr Dave McKay and a New Zealand Publisher this book was printed in June 2013. Distribution began in the USA late July 2013. Coming from so far away, with 700 pages and more than 700 colour images this is a wonderful tribute to a fantastic ship and great crews.